Managing a “dark” or “lights-out” data center is one of the greatest challenges a data center professional can face. When you don’t have anyone on site, how can you tell that moves/adds/changes were made accurately? How do you check power and network connections if you’re not physically there to look at them? And how can Data Center Infrastructure Management (DCIM) help? Best practices for efficient capacity utilization. Tips to avoid downtime during a move to a lights-out data center. Benefits of using DCIM for remote monitoring and asset management processes. 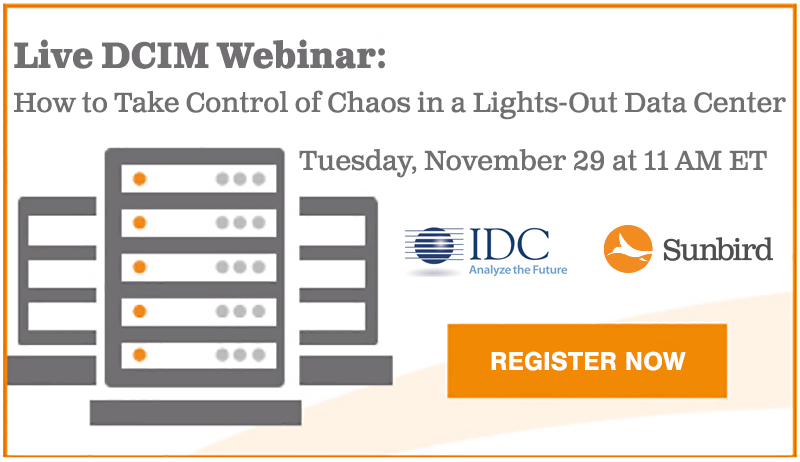 If you’re remotely managing a data center now, transitioning to a lights-out data center, or investigating roadblocks to successfully managing a hybrid arrangement, you won’t want to miss this DCIM webinar. You’ll gain the proven advice you need to conquer the chaos and ensure reliability, security, and efficiency in your lights-out data center. Register now to reserve your spot. Jennifer Cooke, Research Director, Datacenter Management, IDC. Jennifer will lead this interactive, one-hour DCIM webinar that will identify the benefits of using DCIM as a single source of truth to manage data centers of all sizes. Michael Piers, Senior Manager, Deployment & Infrastructure. Michael will share how DCIM has helped him manage a number of data centers, including identifying problems before they happen, and how the integration of multiple tools has helped to eliminate manual efforts. Joseph Keena, Manager - Data Center Operations, UF Health Shands. Joe will share his experiences in the implementation and deployment of data center infrastructure management (DCIM) solutions, and how the Shands’ data center has become one of the most efficient in terms of managing data center resources.